In an intake of a breath, she shifted from smiling and looking a bit weary from work . . . to tears. The person beside her, older and probably her mother, was caught off guard. What do you do with an abruptly weeping thirty-something daughter? The women had been passing in front of my hospice’s table display. Along with a colleague, I staffed the table—covered by brochures, info packets, resource samples, and some very popular mints for giving away—to answer questions about grief support services. The sobbing woman stared at the section of the table devoted to our Angel Babies program. Seven years since the death of her child. 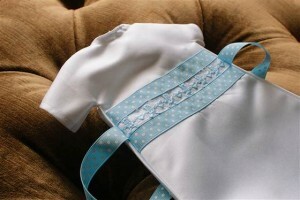 A baby’s gown from the project in Fort Worth, Texas. I gazed at the newly created gowns and held my breath. They were not the vibrant colors of rainbows and spring flowers, but shades of white: pearl, ivory, and eggshell. All were like silk to the touch and probably many were literally made from silk.